Hi! 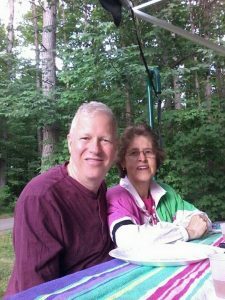 We are Jeff and Kathy Wildrick, and we are on the road in our 2004 Fleetwood Southwind motorhome to see the United States of America from ground level! But who wants to travel all by themselves? We certainly don’t. That’s why we’re inviting you – longtime friends and friends we’ve yet to meet – to come along for the ride. You’re invited to share our transition from Jeff having a full-time job (and income), to living off of our savings plus whatever we can make on the road. How will we get health insurance for us and the kids? How will manage being together 24 hours a day? You can find all of our posts by date and subject in the right-hand column of this page. Have fun exploring. And remember that we are eager to receive your comments and questions. We don’t know exactly where we will be going, but we can’t wait to get there – and to experience the joys and frustrations of the journey along the way. And we’re going to record and report on it all on this blog, and on our YouTube channel, and in more-or-less “real time” on the Miles and Smiles Facebook page. We hope you’ll join us for the journey! Please take a moment to Subscribe, and share with your friends.